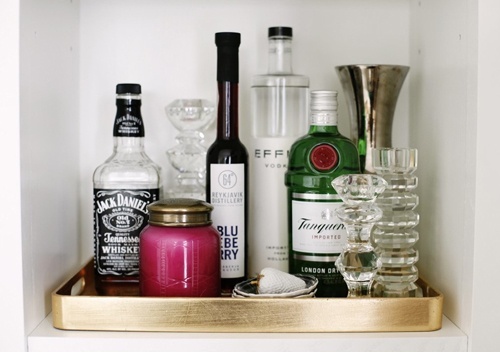 I wish we lived in the Upstairs Downstairs era of champagne and cocktails every evening, as a matter of course, with no regard for what it might be doing to our skin or our livers. 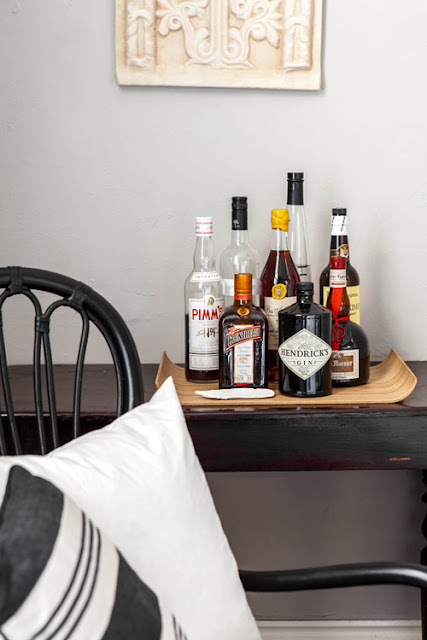 One thing which has stayed with us though is the lovely design and packaging of spirit bottles, and the cuteness and colourfulness of drinks accessories. They're too good to be left in the cupboard. Any small corner of a room can be designated a drinks corner - there's no need for a separate drinks trolley if you haven't the room for it. 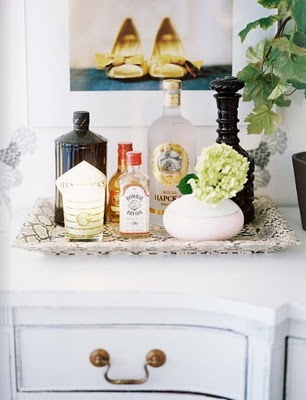 A shelf in a hallway, kitchen or living room will do - and here's where my healthy obsession with trays comes in too - a tray will give you a designated area to display it all on. I've roped in my old egg basket, which I have never really got round to using for eggs. 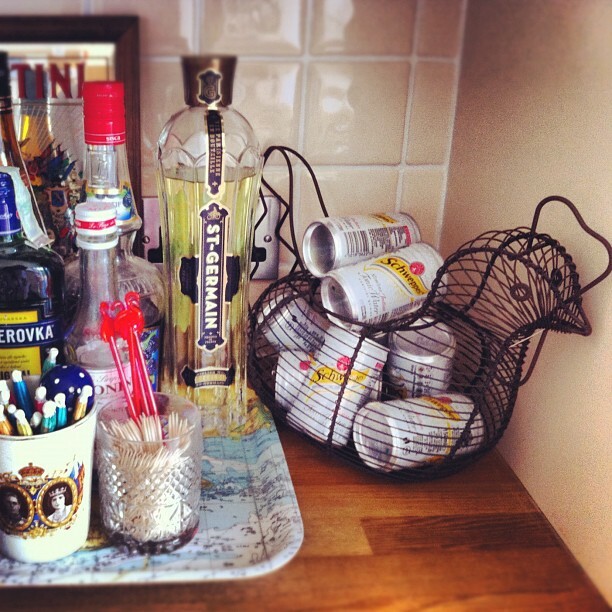 I find it's the perfect vessel for storing my mini cans of tonic. And a Martini mirror, found in a chazzy, makes an excellent backdrop. A Coronation ceramic beaker and crystal glass tumbler make good storage options for cocktail umbrellas and sticks, and my favourite pink flamingo swizzle sticks (I've had mine since my student days, but you can get hold of them here). 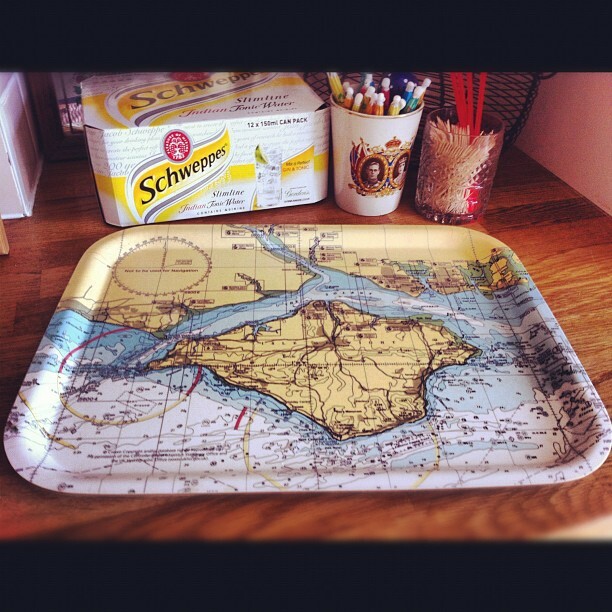 The tray was a gift - this is the Isle of Wight version but I've also seen an Isle of Mann version. 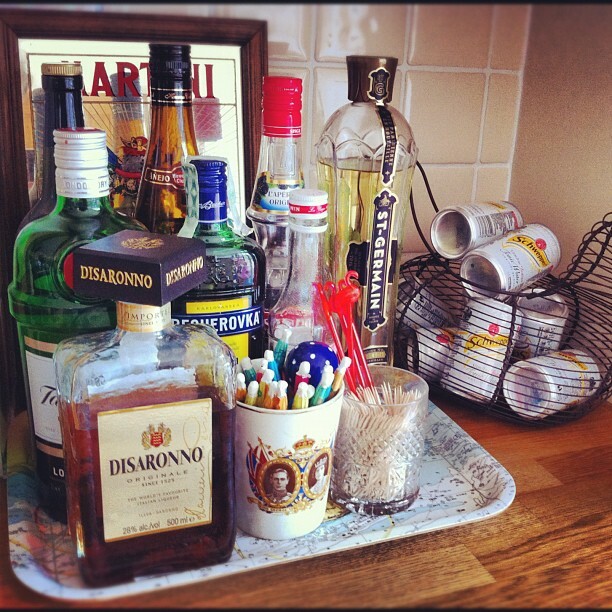 Here are a couple of other drinks tray ideas for you to have a look at.